Pokémon Red Version and Pokémon Blue Version introduce legions of gamers to the world of Kanto, where the likes of Charmander, Pikachu, and Mewtwo were first discovered. Through exciting exploration, battles, and trades, Trainers are able to access 150 Pokémon. You begin your journey in Pallet Town as a young boy. After a dangerous brush with wild Pokémon, Professor Oak teaches you how to capture Pokémon, and then sends you on your way as a fledgling Trainer. During your journey through Kanto, you must capture Pokémon to record their information in your Pokédex, as well as become a better Trainer by competing in Gyms scattered throughout the region. Once you've proven your mettle as a Pokémon Trainer, it's time to take on the Elite Four, a crack group of Trainers that will put all of your learned skills to the test. Your journey will be far from easy. In addition to the many Trainers and wild Pokémon you'll encounter along the way, you'll also have to be watchful of Team Rocket, a despicable group of Pokémon thieves. Prevent Team Rocket from stealing rare Pokémon and stop their criminal ways! 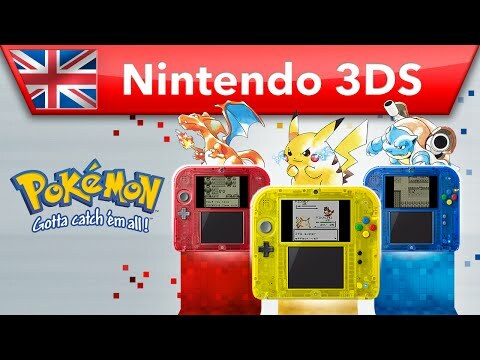 You won't be able to catch every Pokémon in either Pokémon Red Version or Pokémon Blue Version; to collect every Pokémon, you'll have to trade with friends. You can also take your team of faithful Pokémon into battle against your pals to see how well your team stacks up! There's much to see and do in Pokémon Red Version and Pokémon Blue Version. Start your journey through Kanto and become a Master Trainer!